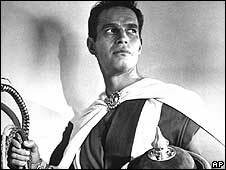 Charlton Heston, who won a best actor Oscar for his starring role in the epic Ben-Hur, has died aged 84, a spokesman for his family has said. Heston died on Saturday at his home in Beverly Hills. His wife Lydia, whom he married in 1944, was at his side. Heston also portrayed Michelangelo, El Cid and other heroic figures in Hollywood films of the 1950s and 1960s. He stepped down as president of US gun lobby, the National Rifle Association, in 2003, citing ill-health. The previous year, he had revealed he had symptoms consistent with Alzheimer's disease. Heston was born John Charles Carter in Evanston, Illinois. He studied acting before serving for three years in the US Air Force. But back in civilian life, Heston went through hard times, while waiting for his first break. In 1952, after working on Broadway, Heston starred as the ringmaster in the movie The Greatest Show on Earth. Four years later, he appeared as Moses in The Ten Commandments, one of the roles which would define his career. After the success of the science fiction film Planet of the Apes in the late 1960s, Heston turned his attention to working in the theatre. 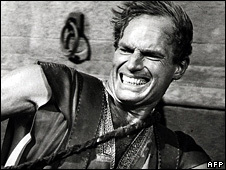 Although later identified with traditionally conservative causes, Charlton Heston had been a vocal supporter of Martin Luther King and the 1960s Civil Rights movement. He also served as president of the Screen Actors Guild and was chairman of the American Film Institute. In a statement, his family said: "To his loving friends, colleagues and fans, we appreciate your heartfelt prayers and support. 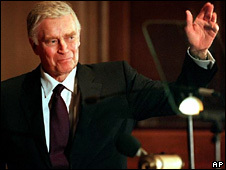 "Charlton Heston was seen by the world as larger than life. "No one could ask for a fuller life than his. No man could have given more to his family, to his profession, and to his country. "In his own words, 'I have lived such a wonderful life. I've lived enough for two people'." His former publicist Michael Levine, who worked with Heston for 20 years, told Associated Press the actor's passing represented the end of an iconic era for cinema. "If Hollywood had a Mount Rushmore, Heston's face would be on it. He was a heroic figure that I don't think exists to the same degree in Hollywood today." Former first lady Nancy Reagan, a Hollywood actress in the 1950s, said she was heartbroken to hear of Heston's death. "I will never forget Chuck as a hero on the big screen in the roles he played, but more importantly I considered him a hero in life for the many times that he stepped up to support Ronnie in whatever he was doing," she said. British director Mike Leigh told BBC One's Andrew Marr Show that Heston's greatest role was in 1958's Touch of Evil, directed by Orson Welles. "To me, his greatest single achievement, was not only that he did probably his best performance in Touch of Evil, is that he suggested Orson Welles," he said. "And they decided to turn his character, who was a regular guy, into a Mexican. I think it was his most interesting and off-beat performance." Heston's family said a private memorial service would be held.